If we were to define photography today, we would have to posit its essential anonymity. To be more precise, we would have to rethink the very conditions of its theorizing: it is no longer “my” photograph that has to be redeemed by being set against the flow of time or the grand narratives of history. (And such, we remember, was Roland Barthes’s project.) It is “nobody’s” or, better still, “whatever” photograph that is likely to take its place in theorizing. This radical shift in the attitude towards photographic representation has been made possible by artists such as Boris Mikhailov. His art which defies all traditional notions of the “artistic” seems to indicate the emergence of a new subject of perception: it is neither the individual nor the mass, but something that, prompted by philosophical reflection, I would rather call community. And precisely this community (or a system of affective ties which precedes any possible value or reified communal substance) is “inscribed” into the Photograph. Before going any further let me stop to make the following clarification: Mikhailov’s photographs testify to a new understanding of both the documentary and the historical. Being a chronicler of the “end” of history, namely Soviet history, Boris Mikhailov has always taken sides with the forces of the private, that is, a living which persists in its insignificant indifference as opposed to the monolith of an historical formation. Such living remains essentially inconspicuous, unnoticed, unseen. And if history does enter Mikhailov’s varying series, it is not by way of signs of the Soviet – something that we, cultural beings, would most easily grasp and discern. Rather, it enters his works as a “structure of feeling” – as that which points to a lived experience of an ever open, mobile collective. This collective, to be sure, is far from being a prescriptive entity: neither the Soviet nor the post-Soviet “people,” it is immersed in a profound and productive form of anonymity – which necessarily brings us back to the nature of the Photograph. What is implied here is far from being mystical or, even worse, irrational. Today any photograph, indeed any photograph whatsoever can take the place of “my” photograph. For “I” am constituted only through my “impropriety,” through my belonging to others. The sharing of anonymity, the singularity of such historical sharing – this is what life in post-industrial societies seems to be about. And it is by partaking in the banal, the stereotypical, or the insignificant that “I” come to see what “I” see, as well as to know what “I” know. 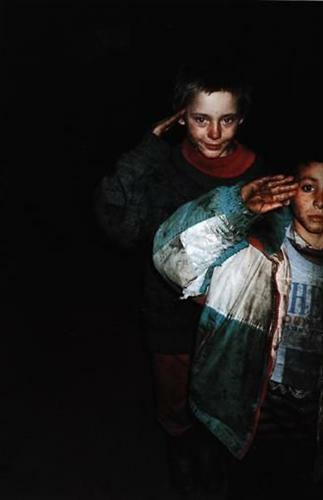 “We” as “they.” Such is the constitutive perspective of all Mikhailov’s series. 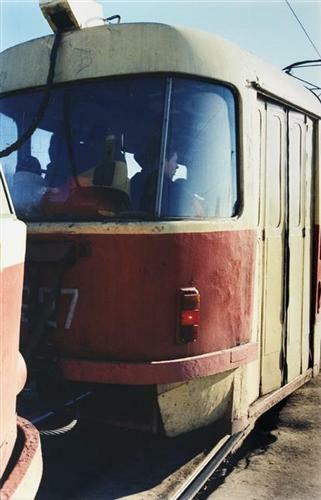 And in this Mikhailov is historical. By dedicating “Dance” (1978) to his own and to his wife’s parents Mikhailov is inviting the spectator to participate in a shared experience of anonymity: it is neither in cultural and ethnographical details nor even in specific dance movements that the past makes itself visible and thus appears meaningful or, for that matter, complete. It is rather the impersonality of the personal enhanced by the shifting of the signifier, something accounted for by the very serial technique that allows one to learn as much from the photos of unknown people as one would from one’s own family album. Communality is a condition for seeing: it underlies the capacity to distinguish and to recognize. 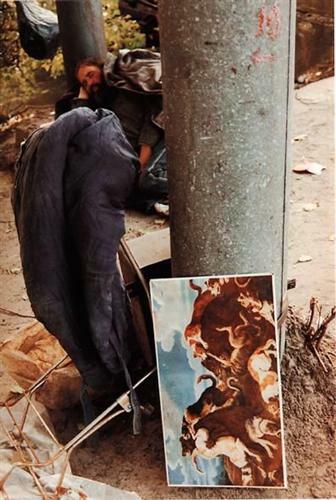 Two of his series, namely “By the Ground” (1991) and “At Dusk” (1993), seem to radicalize the photographer’s own premises. Their implied referent no longer depends on a mode of the private. These pictures do not display the “end” of the Soviet by intertwining it with the present. Or, to put it differently, they do not create a constellation of the past and the present, which (according to Walter Benjamin) alone gives access to the meaning (the “truth”) of an historical event. Here the private – to retain the notion – is raised to a higher and almost unrecognizable degree. For it is transformed into the very condition of being-together – an originary commonality translated into gravity and the absence of light. Let us stop to give a closer look at the series. “By the Ground” and “At Dusk” can be accepted and read as forms of social criticism. The images in the series are harsh and sometimes even brutal: there seems to be no boundary between life and death, between heavy sleep and eternal oblivion. Degraded survivors of a demised imperial Union, the people represented in the photos immediately refer to the lower depths of society. But again: “they” are nothing other than “we,” and there is no way the spectator can escape this compelling and inevitable identification. However, it is not psychologically that the shift is achieved, and it is not empathy that is strangely, if not perversely, set into motion. Rather, the very structure of seeing (and being) accounts for this shift. Mikhailov’s characters here are pressed to the ground. “We” are pressed to the ground. This effect is heightened by the use of the “Horizon” camera which expands the angle by transforming the horizon into a tight and arching membrane. The ground is where communality resides. What is implied is the initial communality resulting from abandonment, from man being “thrown” into this world. And the ground – the Earth – is his dwelling place which he shares with so many others (to remember Heidegger). “We” are doomed to the ground; “we” are blessed with it. It is that space of proto-sociality where distinctions are blurred while adherence is unquestionable – that very “bottom” which is the gravity of all human (i.e. social) beings. Taken from the waist, encouraging the viewers to stoop (both literally and figuratively), these photographs are distinctly metaphysical. Only metaphysics here is not a form of ontology, a “science” of the elements. Rather, it is a dropping out of historical time rendered visible, a moment of suspension and transition. It is the dismantling of society in favor of the forces of the social. And such forces are always already at work. What is it to be deprived of light? Is it the saturation of reality, so reminiscent of the Hegelian work of conception when philosophy or, rather, photography, better still – photography as philosophy, tries neither to amend nor to rejuvenate existing things, but instead is always late in its arrival? Is it, in other words, the beginning of the “dusky” task of thinking? The black and white series “At Dusk” is all toned blue. However, blue is not a color. It is not a color in the sense that it renders no symbolic associations. It is simply the absence of light. It is the absence of that very light which is essential to the self-definition of photography (“the writing of light”) when it emerges as an art form. But likewise it is the absence of the light of Reason which penetrates even the darkest resorts. Here there is no light, and no light indeed is possible – only the imprint left by terrestrial beings, by the forces whose work remains invisible. 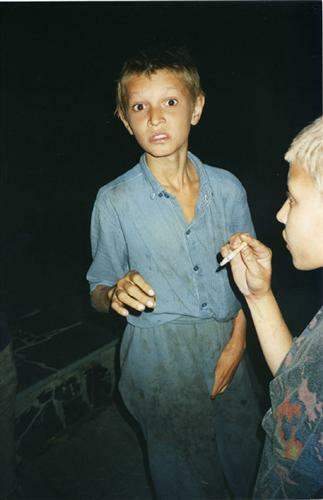 Boris Mikhailov is a new metaphysician: he pushes photography to its very limit where what is seen becomes inseparable from the conditions of seeing – whether those are patterns of affectivity or contemporary communal experience as such. Lost in time – this is the impression one gets from examining the two mentioned series. But in fact all of Mikhailov’s works have to do with time in one way or another. The bleak amateurish images of the “Unfinished Dissertation” refer to contemporaneity as retrospection: it looks as though events are recorded after the fact, by way of hindsight and that contemporaneity (for lack of a better definition) is nostalgic of itself. Such is the experience of time when nothing seems to happen – I am referring to that non-heroic period of recent Russian history which is sadly known as “stagnation.” Indeed, what Mikhailov’s photographs display is a unique temporal structure, a kind of superimposition: (un)fulfilled Utopia made visible in the very desolateness and deterioration of the Soviet public spaces and the present time of private existence confined to its own limited span. And yet it is within this span of time, the unfinished project of an ever open living, that events, however insignificant or imperceptible, occur. Such time transforms into space, indeed it stretches and expands, and by rising to the surface it keeps filling space with itself. Truly, there is no other time except for this expanse of the present. And the present does not become part of memory, instead it seems to attach itself to the surface of things and the visible world as a whole. Mikhailov allows us to see what, for better or for worse, remains invisible: the energies of the private, inherently subversive, working their way through independently of an ideological setting (even if they are not overtly directed against official prescriptions and norms). It is clear that the forces of the private are on the side of the imperfect and the incomplete. For imperfection and incompleteness are a way of positing that what remains in the making, what avoids every determinate form. Paradoxically, however, in the late period of Soviet history such forces seem to break into the field of vision by precipitating as “gray” (to use Mikhailov’s telling term). Again “gray” is not simply a color or a metaphor for the unspectacular state of affairs. Neither is it just a keyword for the “new artistic sensibility” which, according to Mikhailov, requires “taking pictures in such a way that the photograph, even before it is made, immediately appears somehow – old, somehow – already known, somehow – seen before.” Rather, it is a way of registering the existence of an Other in the Soviet, something that keeps displacing the Soviet from within, that accounts for its fundamental non-identity. What is meant by this is the non-photographic in photography (to reinterpret Mikhailov’s own formulation), in other words, the rendering of an historical moment when what we see comes hand in hand with the very conditions of seeing, when “precipitation” is made possible by the act of recognition (“we” recognize “them”) pointing to the coming through of certain structures of feeling and simultaneously to the final “developing” of the photographic image itself. I am referring of course to experience. To the kind of experience which can neither be accumulated nor truly represented. To the experience of time and of a common being in time. Finally, to an experience which time itself renders meaningful because its meaning is never fully given at the moment of its taking place. The meaning of such experience becomes complete when it is intercepted, so to say, by another experience – seemingly foreign to it, yet one which does not fail to recognize itself in the former. Recognition is not a random word. We may recognize what we have never seen, yet something for which we have some sort of penchant or craving. Mikhailov’s pictures are so poignantly up-to-date precisely because they activate and validate our fantasies of history. Fantasizing the historical has nothing to do with falsifying history. It has to do with the functioning of an imaginary which is itself a shared experience of the historical. For different reasons we, the imagining or fantasizing collective, have no direct access to even the most recent historical events. What we tend to miss and what remains ungraspable is the emotional life of our fathers and grandfathers of that other generation, those other generations which are so close and at the same time infinitely remote. In the context of my own country’s recent history, this is dramatized by the abrupt rupture with the Soviet past which many of us remember quite vividly as part of our own continuing lives. We have thus become bearers of a traumatized or split identity, to use more specialized terms. And, perhaps doubly so, have our fathers. Therefore, an individual’s “own” past seems to be disowned. But it is by means of this rupture, this involuntary disavowal that we may be truer to ourselves than at any other moment whatever. For this break stands for nothing other than experience which is a way of coming back to what we never have been. Coming back to a non-place, returning to a non-identity: this is the core of the matter. And in this we are aided by others. We return to “ourselves” through so many expectations and dreams which we share with the others. However, it would be wrong to suppose that we are the masters of such dreams and emotions. On the contrary, the “we” itself derives from the fantasy life of a free-floating collective – it may well be called “generation” – from the affects that crystallize it into some sort of fuzzy and transient whole. And it is through and in the photograph that such mechanisms may be set into motion. But of course this holds true not of every photographic image no matter how artful it is. Only photographers as acute and also as unpretentious as Boris Mikhailov have succeeded in uncovering and mobilizing this potential. Something undeniably unites all of these photos (Mikhailov likes to call them “snapshots”) – a form of lyricism which is interspersed with irony. However, one is inclined to regard irony not as an adopted attitude, indeed a mode of estrangement, but as the irony of life itself. By “life itself” I am again referring to the private in its elemental state, so to say, to what does not stand in opposition to anything at all in principle. This layer of the private informs social being prior to and irrespective of any forthcoming determination, and it has nothing to do with “taking sides.” This is the reason why Mikhailov is neither “for” nor “against” manifestations of the Soviet – his very vision prevents him from adopting a stance. Instead, he seems to be fused with everyday living which is prescriptive of camera angles and the direction the look itself would now and then take. And if Mikhailov is “spying” on something (to cite his own acknowledgement) he knows that someone or something is likewise “spying” on him. What in fact Mikhailov “shows” is the world prior to its embodiment, to its various forms of (self)-presentation. Thus, even the face, this epitome of classic portraiture, becomes in many ways accidental: no longer the bearer of beauty (or vice versa of ugliness), it ceases to be central to the “composition.” Far from that. The face in these images is a random fold of the social landscape, just one of the endless figurations of “life.” The face, moreover, is meaningful to the extent to which it tends to be de-faced, since only the flow of collective affects endows it with any possible meaning. In the series “Dance,” however, we do see many faces and are touched with what appears to be their fleeting expression. And yet more often than not this is simply a posture, a way of showing oneself, the countenance included, in one’s Sunday’s best. What higher truth of themselves are these people imitating? How much are they trying to give away and with that very same gesture to hide? What we “see” is an attempt at turning the face into its own (better) image, at placing it into some pleasingly elevating invisible frame. In short, at rendering it as Face (with a capital letter). Yet, by the same token, we are given access to the anonymity which underlies any and every one of these attempts. What is disclosed, therefore, is not so much the power a personality enjoys over its psychological states or emotions but the singular aspect of that very “life” which, while binding people together, precedes individuation as such. Together with the impulse comes the project itself which in the best of cases embraces a lifetime. If the project has a powerful explorative potential, if in one way or another it is social, then we will surely be enjoying its artistic outcome. By “social” I mean a complicity with one’s own time and place. 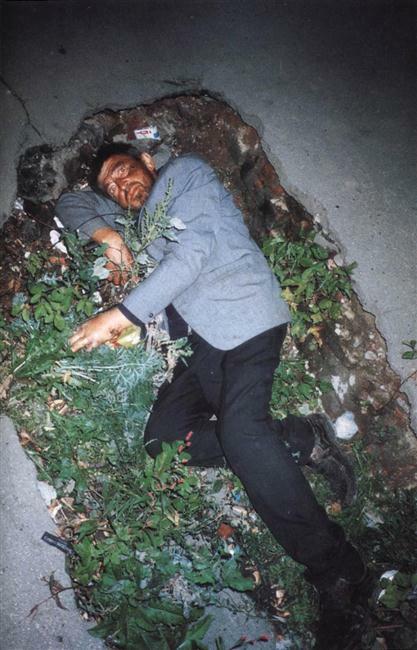 Boris Mikhailov is undoubtedly social in that he is a student of the lives of his contemporaries. Including and even starting from their fantasy lives. But also he is someone who has a true passion for living, and he has found the unique and wonderfully diverse means of translating it into his photographic work. Not compassion, but co-passion, privacy which is inseparable from the lives of others, which is the sharing of a life with others – such, it seems to me, is the hallmark of his art. The citation reference for the published work of art: Mikhailov, Boris. Unfinished Dissertation. Zurich: Scalo Publishers, 1999. It is forbidden to take photos that bring into disrepute Soviet power and the Soviet way of life. It is forbidden to depict any naked body. Only museums can display such pictures, in (non-pornographic) Old Master paintings. Kartochki, a Russian diminutive of ‘cards,’ suggests that we might review the pages of Unfinished Dissertation as a set of cataloged index cards. Today’s standard rendition of Soviet history purports that during the period between Brezhnev’s death and the implementation of perestroika, production and consumption stagnated, a situation that the state apparatus could not convincingly repudiate even with prolific documentation in the weekly illustrated newspapers of the joyous totality of Soviet experience. Consequently, Soviet byt, everyday life, can be characterized as the “expulsion of the event (in its everyday understanding).” With innumerable ironic gestures Mikhailov cataloged the astounding diversity of the important everyday lives of anonymous people and the city. Archive: picnicking; two people walking to the communal housing block; man arobicizing in front of the television; boys crouched behind a jumble of twigs throwing stones ; people sitting on the tram; old woman carrying home a loaf of bread; woman lying half naked on the sofa; photographer sprawled half naked on the bed; leafless birch trees swaying in the wind; mud covered streets, shoes tied to a fence … There is no political power without control of the archive, if not memory. If Unfinished Dissertation can be read as an archive, this might suggest that a total formulation of knowledge of Soviet byt was achieved. Yet, this archive was pieced together randomly, a jumbled collection of snap-shots and fragmentary notes, and therefore can only be read as an incomplete set of juxtapositions through which one assigns associative meanings. Any pursuit of byt in its totality is here merely exposes as photographic instances where the people and the city of Kharkov are in the process of being and not-being determined, where situations spring forth actions, events, and results without warning. Everyday life and photography here share the common characteristic of ambiguity. Such are the varying aspects of everyday life: fluctuations beneath usable masks and appearances of stability, the need to make judgments and decisions. Engagement with byt and photography seem to require and determine a critical and self-critical consciousness. 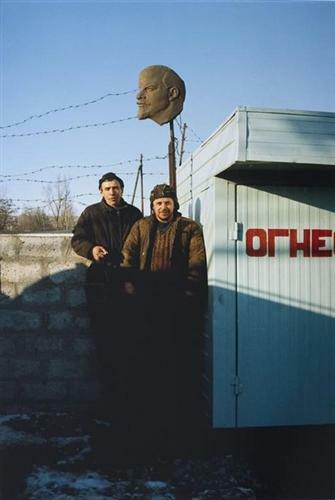 By photographing Soviet byt as not-yet-determined, as non-events, Mikhailov takes a critical position toward historification produced by the Soviet state. The critique of everyday life involves a critique of political life, in that everyday life already contains and constitutes such a critique.